Gary speaks on training at one of his provocative and stimulating seminars, we cut to the gym to illustrate the relevant exercise. We bring to you Gary’s complete 3 day hard-core, blood and guts gym workout. 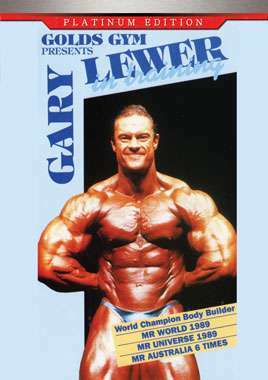 This DVD was over 12 months in the making as our cameras follow Gary to victories at the NABBA Universe in London, the World Championships in Spain, and training and seminar in Australia. In a totally fresh approach, we present the visual and spoken training lore of Mr. World. As Gary speaks on training at one of his provocative and stimulating seminars, we cut to the gym to illustrate the relevant exercise. We bring to you Gary’s complete 3 day hard-core, blood and guts gym workout. Gary also lays it on the line with total honesty when he discusses steroids and steroid testing; this video is a ‘must’ for all serious weight trainers for this segment alone. He also talks about nutrition, and all aspects of serious bodybuilding. You will see Gary in top condition as he is compared with the best in the world and matches them pose for pose, muscle for muscle. He then presents his dynamic posing routine for the crowd.